Boley 12 Pack Sling-Powered Water Party Pool Launcher - Perfect For Kid's Birthdays and Bath Tub Toys - Ideal Party Favor Gift! Bath tub water balls perfect for pool parties! SLING FEATURE: Our water bombs feature an exciting sling feature, putting a fresh twist on children's pool-play water bombs! GREAT FOR POOL PARTIES: Wage war together with friends and family with sling-powered fun-soaked water bombs! Plenty of ammunition for all family and friends! SOFT AND DURABLE: Made with soft water-absorbent foam and a smooth fabric exterior to maximize water capacity! 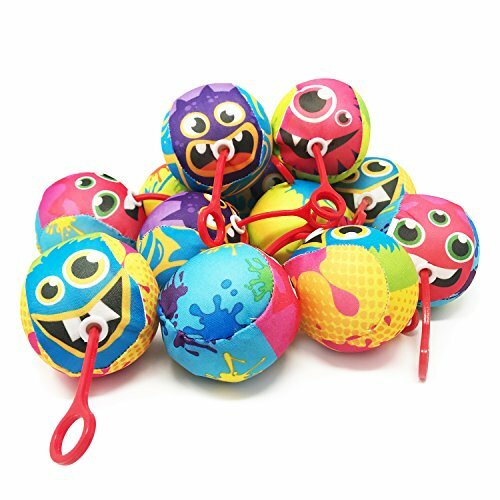 WILD PARTY DESIGN: This arsenal of assorted water bombs come in four fun multi-color designs! DIMENSIONS: These water bombs have a 3" diameter. The sling handle adds an extra 2" to the length of the water bomb. If you have any questions about this product by Boley, contact us by completing and submitting the form below. If you are looking for a specif part number, please include it with your message.